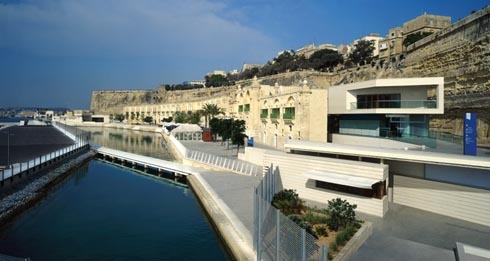 The Valletta Waterfront project has recently been awarded another prestigious honour. The project, designed by AP in collaboration with landscape architecture firm EDSA, was awarded the 2010 Award of Merit for ‘Recognition of projects that demonstrate an exemplary use of landscape architecture practices’. The restored Waterfront competed and won in a worldwide competition organized by the Florida Chapter of the American Society for Landscape Architecture (ASLA). The south-east section of the American 17,000 member national association for professional landscape architects, recognized how the project’s commercial development and the historical value of the site, were enhanced simultaneously through the restoration programme carried out by AP. Furthermore, the work on the project restored the ex Pinto Stores to the prominent Baroque splendour they enjoyed in the past. The project was responsible for the social regeneration of the Waterfront site, and gave a new dimension to the urban make-up of the city of Valletta. As a result of the success of the regeneration project, new life has been breathed into the previously derelict site, with special emphasis on cruise ship tourism, which has consequently increased by approximately 500%.